HOHENFELS, Germany -- U.S. Army Europe's 2013 Noncommissioned Officer of the Year, Sgt. 1st Class Sergio Velazquez, is gearing up to face competitors from across the Army in the U.S. Army Best Warrior Competition, held in Fort Lee, Va., Oct. 16-18. 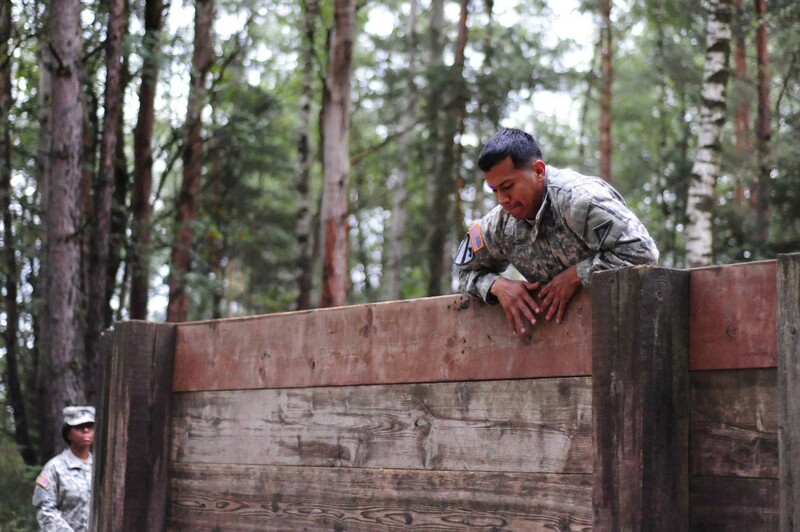 Velazquez, an infantryman assigned as a platoon observer controller-trainer at the Joint Multinational Readiness Center in Hohenfels, battled his way to the USAREUR championship through six grueling days of competition at U.S. Army Garrison Grafenwoehr last month. The recent Best Warrior competition tested Soldiers from across USAREUR on military knowledge and skills through more than 30 tasks such as land navigation, weapons qualifications, combat first aid, and a combatives tournament. Competitors also took a written examination and demonstrated their knowledge on a wide variety of military topics before a board of sergeants major. "My favorite event was the 'call to fire,'" Velazquez said. "You're talking to these two Apaches (helicopters) on the radio and you're watching them engage targets on the range with actual 30mm machine guns. I think everybody enjoyed that one." Velazquez said he felt he had done well during the competition, but was still surprised when announced as the winner. "The goal was really to represent the unit well," he said. "I'm proud to bring it home for the unit." Velazquez has little time to rest on his laurels, though. He's already focused on the next round of the competition and will be heading to Vilseck soon to begin preparations. "The unit has a month long training set up for me," he said. "It involves a lot of combatives, there's a medical lane that I'll be going through. They have a lot of stuff said up so it's going to be pretty cool." While he admits that participating in the Best Warrior is strenuous, Velazquez said he enjoys competing, and that he gets a lot out of it. "It does take a toll, especially the first few days because you don't get much sleep," he said. "Really, it's all about being prepared. If you're prepared physically, that's about half the events right there. Then it's just up to you as an NCO to get into the books, the field manuals and study guides, and looking over the material." Velazquez said he's excited to pit himself against the best the Army has to offer. "It's all about seeing what the next level brings in terms of competition. Everybody wants the same thing, everybody wants to win. I operate well under pressure. I'm going to go out there and do my best."